Is there any better method of preparing potatoes or vegetables than roasting them? If you’re stuck here, the answer is an emphatic no. A little olive oil, a sprinkle of salt, and a high oven temp can make even the blandest of foods into hot, crispy deliciousness. If you start with a sweet, starchy, flavorful base to begin with and toss in some extra herbs and salty Parmesan cheese, then you can elevate the dish even further, resulting in these absolutely decadent Parmesan Roasted Sweet Potatoes. These potatoes are perfect: a little crispy on the outside, soft and sweet on the inside, and coated in roasted Parmesan, garlic and rosemary for a beautiful blend of flavors. They’d be a lovely complement to any meal and would even make a deliciously hearty and healthy Thanksgiving side! Preheat the oven to 400 degrees. Line a large baking sheet with parchment paper and set aside. 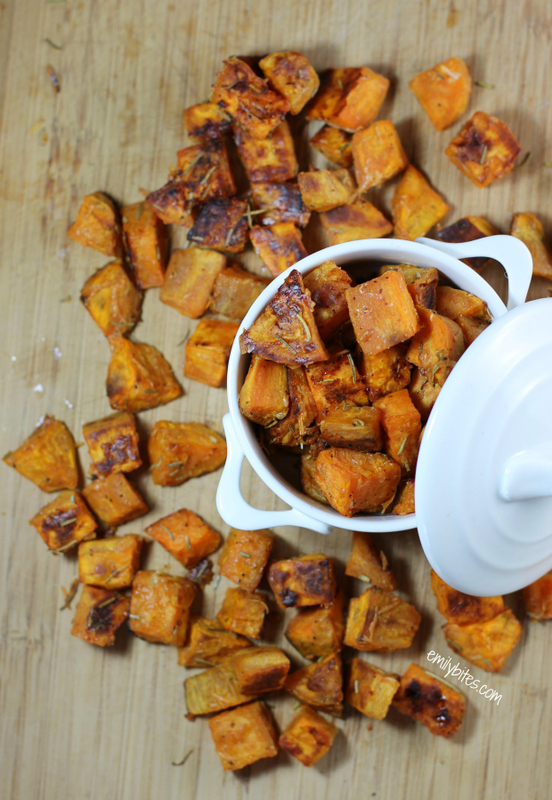 Place the sweet potato cubes in a large bowl and drizzle with olive oil. Stir to coat, making sure oil is evenly distributed on the potatoes. Add the rosemary, salt, pepper, garlic and Parmesan and stir until well combined. The cheese and seasonings should stick to the potatoes. Spread the potatoes across the parchment-lined baking sheet in a single layer and make sure to sprinkle anything left in the bowl over top. Place the potatoes in the oven for 35-40 minutes until the potatoes are browned on the bottom and soft in the middle. 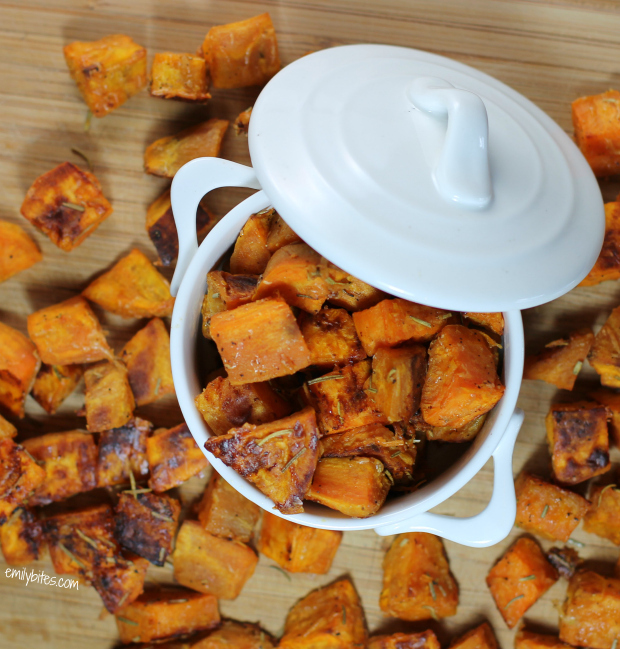 I love roasted sweet potatoes but have never added parmesan to them, YUM! I agree…you just can’t beat roasted veggies of any kind. And I love the saltiness of the Parmesan with the sweet potatoes. You can not beat roasting veggies, it is always the way to go. These sweet potatoes look like a great side dish. Heck, you had me the minute you mentioned roasting sweet potatoes. Then you went and added the Parmesan and rosemary and took them over the top. That looks like a perfect Thanksgiving side dish! I love anything roasted – will be trying these soon. Thanks! I just made these. So GOOD!!! I am stuffed full of sweet potatoes and didn’t really eat the other parts of dinner. Great recipe. I’m so happy you love them! We have tried all sorts of sweet potato recipes through the years. This is the best one we’ve ever had. The small cubes allow them to crisp up nicely versus SP fries, chips, etc. We will definitely keep this one on the top of the list! I have tried so many of your scopes — we love your Meat Lovers pizza..but this recipe tops them all! My husband was a little apprehensive when I mentioned Parmesan on sweet potatoes..he was a fan as soon as the oven timer went off & the baking sheet came out! Thanks! !